These granulating systems (also called “shotmakers”) are developed especially for granulating bullions, sheet metal or casting residues into proper grains. The granulating tanks are very easy to remove for clearing. 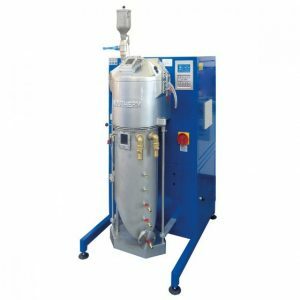 These shotmakers are developed especially for granulating bullions, sheet metal, or casting residues into proper grains. The granulating tanks are very easy to remove for clearing. The GU machines are available with crucible sizes from 245ccm, up to 12,000ccm. The GU micro series was developed for the production of micro granules with a grain size of between 0.1mm and 1mm. The systems are based on the Indutherm granulation units, but all key components, particularity the jet system, are special developments. The main areas of application for the micro-granules are in metal laser sintering processes, in jewelry surface design and in soldering technology. The optional equipment of a vacuum pressure or a continuous casting machine with a granulating tank is a suitable solution for occasional granulating. Granulating tanks are available for all machines in the VC series from VC400 up to the VC12000 and all CC machines. We have been operating for over 69 years. For 14 years, we have the largest inventory of parts and consumables with locations in New York, and California. © 2018 Romanoff West. All rights reserved.